Realizing how long it's been since I've posted to this blog, I'm including more photos to make it more interesting. I like looking at pictures, don't you? "cousins," Pumpkin and Buddy. Emmy and Pumpkin came visiting and made us smile with their "childlikeness" and energy! They really ate up all the attention! Kelsey babysat Sarah & Joel, with a friend's help, for 3 days. Joel says things in the most amazing way! There's no one like him! I can't wait to see what he's going to be like when he grows up! When I went to pick up Kelsey and the kids to take them to their friends' home, I sprained my ankle! Kelsey went to the car to tell Joel and Sarah what the delay was about, and when I came to get in the car, Joel said to me (with his cute little "lithspy" voice), "It took a long time. Kelsey told us why and I feel really bad." I told him it would be fine, and not to feel bad. He said, "Well, I still love you, but I still feel really bad." How can you not love a kid like that! Later, as we drove, he asked what the speed limit was, and when I told him, he told me he would be watching my speed, (And he did!) "cuz you don't want to get a speeding ticket." After the late March snowstorm, the ice is off of the lake! Today I saw the first canoes on the lake, and heard the geese flying in. 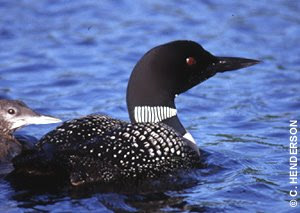 One morning last week I heard the plaintive call of a loon! My mom still plays beautifully at 87 years young! From our Mexico Mission Trip Presentation given at church March 22, 2009.